Udayakantha Warnasuriya sizzled the audience with his Roshan-Pooja starrer, Aasai Mang Piyabanna which rocketed him further into the place of being one of the industry’s most sought after directors. Now he is all set to shoot his latest movie Paya Enna Hiru Se for which he had roped in popular actor, Ranjan Ramanayake, and Udari Warnasuriya, a new actress, to the scene. Behind the sets of his movie Udaya shared his thoughts with the Daily News. ä What is Paya Enna Hiru Se about? This is a story about a girl who makes a request to a gangster to look after her family. It has a simple and entertaining plot based on a family. ä Why did you decide on Ranjan for the main role? I had him in mind even when I was writing the script. There is a lot of action and comedy in the film. ä What made you decide on a relative new comer for the opposite lead? I try to introduce a new face with each one of my movies. Udari sent me a letter with details saying that she would love to act in a film. I get many requests of that kind but she was lucky to be chosen from many others. We met, spoke and she acted a few scenes for me. I recognised her talent. We have shot a few scenes and I am satisfied with my choice. ä All your films somehow seem to work at the box-office, not to mention the audience. What would you attribute your success to? Your ability to sniff out a great script or pure luck? A bit of both. It is necessary to recognise your audience and their tastes. That is a even greater challenge than coming into terms with the characters. I believe I have excelled in that aspect. I wish to approach the classic cinema scene but entertainment cinema is my forte. ä What hopes do you hold for Paaya Enna Hiru Se? I hope that it would succeed with the audience. That will be a boost to both me and the industry. The film possesses all the qualities of a hit and I think I have recognised the recipe for a successful film. ä With many box-office hits under your belt do you believe you have accomplished your goals as a director? No. I have a long way to go. There are about 10 more stories in my mind at the moment which can be turned to entertaining films. I am fortunate to have a dedicated cast and crew in my productions. ä What are your creations that are in line for the future? I have already completed writing two scripts for my upcoming films. Rankevita 2 will be coming next and I have been speaking to Tissa Abeysekara. Time is scarce as I am very dedicated to my creations but I am capable of producing at least one film per year. For the past few days there were some questions that Ranjan Ramanayake was asked with punishing and unfailing regularity. One of which is certainly what keeps his much hyped about movie, ‘Leader’, on the lurch. 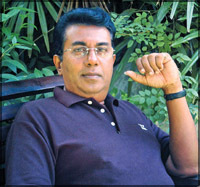 Another is why he decided to back off from the popular programme “Sirasa Dancing Stars”. “All the work in ‘Leader’ is complete but I felt that this is not the appropriate time to release the film. The country is suffering from a lot of problems. Cost of living is high and increasing day by day and the security concerns are there. People need to live a comfortable life before being lured to see a film,” Ranjan explained. ä Tell us about your new film, Udayakantha’s Paya Enna Hiru Se. It is the fifth time I am working under him. I have contributed to his projects like Sagaraya Parada, Rosa Wasanthaya, Yakada Pihatu and Bahu Bahrya. This is the first time I took on a movie under another director since I turned director. I am doing dual characters in Paya Enna Hiru Se. One is of a decent citizen called Suren and the other is a gangster called Suraj. ä Some accuse you of using cinema for political purposes. What is your response? People can say anything. Everybody is power-hungry. If I want to use my profession for political means I could have married a politician’s daughter or a gem merchant’s daughter, lead a luxurious life and join the Government side. If I am using art for politics why should I go to the losing party? I enjoy working on behalf of the poor people and I am involved in a project to help Sri Lankans working in the Middle East. These days we are trying to save the life of Rizana who had been accused of a crime she had not committed. ä You got a lot of response for ‘Sirasa Dancing Stars’. Why did you decide to quit the programme? I see the programme is a great opportunity for our actors to that they are good at dancing. There was a belief that Sri Lankan actors are not good dancers but this was proven wrong. In films if you are not satisfied with one take you can go for more but in this instance you are performing on the stage. If you perform badly you get less marks. It all comes together in one take. I loved that challenge and besides they requested for my support to boost their ratings for their debut programme in the series. I have been nominated the most popular actor five times at the Sarasaviya Film awards and I clinched the People’s Award last year. People vote for me for different reasons. Some vote because they like my films and others vote for me because I have helped them. Some of the other contestants are not in a position to compete with me in this respect and I felt that it is not an honest game.